Outdoor Research Oberland Heated Gloves. Even a run to the grocery store can be epic in the middle of a winter storm. 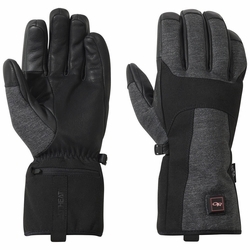 With an under-cuff design and in-town styling, the water-resistant Oberland Glove brings the on-demand warmth of OR's ALTIHeat™ technology to everyday life in the mountains. EnduraLoft™ insulation provides essential warmth on moderate days and a Sensor-enabled leather palm and keeps you dialed in when you want to be.